Today is the day to spice your life in the verdant greens and unspoiled beauty of Corbett National Park. In the morning jeep driver will pick up from the resort and take you to Dhikala /Gairal forest lodge via Dhangarhi gate. Check-in at forest rest house where room is already booked for you in advance. Take short break and get ready for the first exciting jeep safari in search of remarkable wildlife of Corbett. 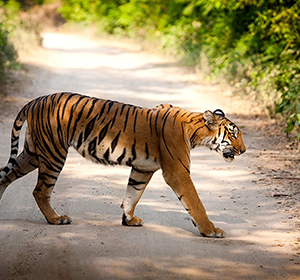 We head through one way Shambar road which is famous for spotting the tiger. The 03 hour game drive will pass through the most amazing flora and fauna of the park. Later in the evening, come back to lodge. Don't be panic as the rest houses have electric fencing that keeps you safe. You can share the thrilling and exciting safari experience with your group members sitting in the verandah area. Have dinner and overnight stay at the lodge. Tour to Dhikala is incomplete without an elephant ride that gives you an opportunity to amble over the lowlands at an altitude of 09-10 ft. high. Elephant safari takes you to those areas of the forest where jeep can't go. It is a great idea to observe the breathtaking view of the valley and jungle. Expert Mahaouts takes you inside the deep forest from where some wonderful sights can be seized. After safari come back to lodge have refreshments and take rest. Soon after the lunch get ready for the second jeep safari. Get into the open jeep and figure out the beauty of jungle that is beyond your imagination. Later in the evening come back to lodge and have dinner and retire for the night.